Disease prevention and control of the most prevalent communicable diseases, such as malaria, and first aid and emergency measures. Family health services including maternal and child health, immunization, nutrition, family planning, and adolescent and reproductive health. Hygiene and environmental sanitation including excreta disposal, solid and liquid waste disposal, water supply and safety measures, control of insects and rodents, and personal hygiene. Health education and communication on an outreach basis. A Primary Health Care Unit (PHCU), which includes one health center and five health posts. These form the bottom-level component of the country’s health care system. 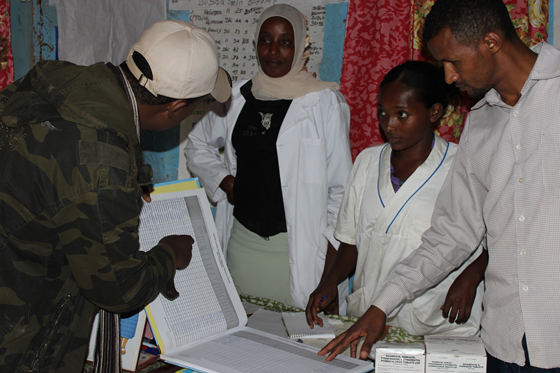 The PHCU plays a critical role in the delivery of primary health care to the rural population of Ethiopia. Health posts provide preventive and promotive health care, including healthy living and environmental sanitation, prevent major public health diseases and epidemics, and mobilize community for health actions. Each health post serves up to 5,000 people. Health centers serve as first-level referral for health posts and provide curative care for a variety of common diseases. They also provide emergency surgery in selected areas. Health centers serve up to 25,000 people. Woreda (district) hospitals provide secondary referral care, including surgery and specialist care, and serve up to 250,000 people. Zonal hospitals provide tertiary referral care, including surgery and specialist care, and serve up to one million people. Specialized hospitals train medical students and other health professionals. The operational level of the Health Extension Program is the health post. It functions under the supervision of the health center. Health posts are located at the Kebele level (i.e. lowest administrative government unit). Each health post is an operational center for two health extension workers (HEWs).